Last year Crossline Skipper was found at two sites in the Saint John River valley (at Douglas and Gagetown). These were the first records of this species in the Maritimes. Hopefully this year more locations will be found. The species is most likely to be found in southwestern New Brunswick. It should be flying strong for at least another couple of weeks. 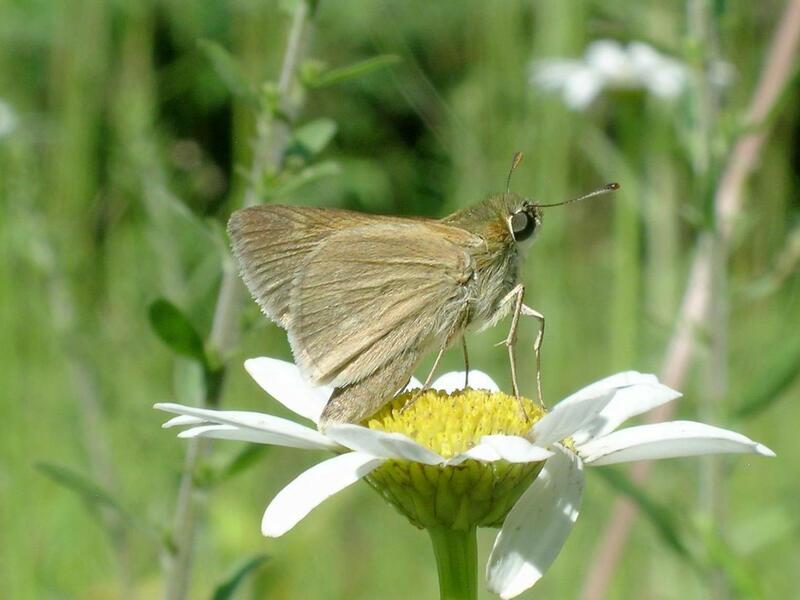 Like many of our other skippers, Crossline Skipper can be found in grassy meadows, along open sunny trails, and vacant lots. Crossline Skipper has probably been on the wing for a couple weeks now, and it will continue flying into early August. It is very similar some of our other skippers, particularly Tawny-edged Skipper. Crossline Skipper is larger than Tawny-edged, and should appear fresher or less worn where the two are flying together, as Tawny-edged emerges a couple weeks earlier. For a more thorough discussion of how to separate the two visit http://www.massaudubon.org/butterflyatlas/index.php?id=103. Because Crossline Skipper is so similar to others, participants are encouraged to collect voucher specimens of this species. We are entering a time of year when many species are at the end of their flight seasons. There are however still many interesting species to be found. Interesting records that I’m aware of from the past couple of weeks include Striped Hairstreak at Miramichi (Peter Gadd), Two-spotted Skipper at New Scotland Road, NB (Peter Gadd, Lois McGibbon, and Anne Marsch), and at Anderson Settlement, NB (Stu Tingley), Indian Skipper and Eastern Tailed-Blue along the Magaguadavic River (Dwayne Sabine), and Meadow Fritillary on the Nashwaak River, NB (Tony Thomas). The Two-spotted Skipper record from Anderson Settlement is only 15km from Nova Scotia, where the species has never been recorded before! Bog Copper and Northern Blue are flying now in bogs (Bog Copper throughout the Maritimes, Northern Blue in coastal areas), so if you haven’t seen those species yet try getting out into a boggy spot. You might find Least Skippers in the wet areas adjacent to the bogs, as well as along grassy river margins and other grassy wet areas. Salt Marsh Copper should be flying now, they are common in Northumberland salt marshes in New Brunswick, PEI, and Nova Scotia. There still exist some big gaps in the distribution in Mainland NS, take a look at the maps. If you’re in the New Glasgow or Antigonish areas take a stroll in a saltmarsh, you might me able to fill some of that void!